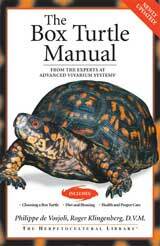 The Box Turtle Manual seeks to help prospective owners keep their turtles healthy and happy. Given the low price tag placed on a box turtle in a pet shop, many casual shoppers add a box turtle to their household without preparation or knowledge about how to keep the animal alive. Since quality information is difficult to find on box turtles, Philippe de Vosjoli and Dr. Roger Klingenberger remedy the situation with this Advanced Vivarium Systems edition dedicated to box turtles. The authors believe that these popular and beautiful turtles . may teach you one or two lessons about the delicate balance of life, natural law, and the many ways in which intelligence in manifested in nature. The book presents background information and guidelines for caring for a box turtle, including selecting a health specimen, acclimating the turtle, indoor and outdoor housing, heating and lighting requirements, feeding and handling, hibernation and breeding. The authors recommend three specific species of box turtles as good pet candidates: they provide photos and information on ornate box turtles, common Asian box turtles, and Chinese box turtles. Dr. Klingenberger provides a chapter on diseases and disorders that gives specific advice about dealing with dehydration, nutritional problems, parasitic problems, and vitamin deficiency. A five-page troubleshooting chart for health problems concludes the chapter. Resources and index included.